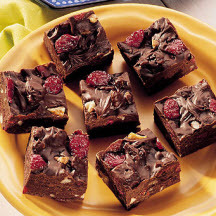 Fresh cranberries easily add a festive holiday taste to chocolate fudge. Line bottom and sides of 8x8x2-inch pan with plastic wrap. Set aside. Bring cranberries and corn syrup to a boil in a medium saucepan. Boil on high for 5 to 7 minutes, stirring occasionally, until the liquid is reduced to 3 tablespoons. Remove from heat. Immediately add chocolate chips, stirring until they are completely melted. Add remaining ingredients, stirring vigorously until the mixture is thick and glossy. Pour into prepared pan. Cover and chill until firm.